Why did the chicken cross the strings, to scratch and screech on the other side! Ok, I'm learning the basics in this video and I think on of the biggest issues I am having is string crossings. Are there many exercises I can do to promote proper form when crossing the strings? Warning: Your ears will bleed when watching this video! practice those string crossings over and over, GDGDGDGD ADADADAD EAEAEAEA with a metronome. 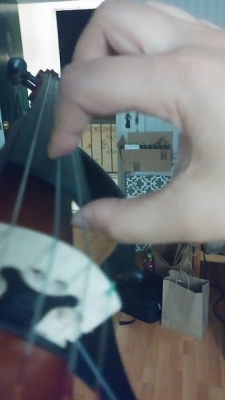 Imagine the tip of your elbow making smooth circles as you cross the strings back and fourth. Keep the wrist nice and loose and relaxed. Then just close your eyes and breath with the motion. FirstPancakes suggestion is good for string crossings. Try to memorize the distance in how much you move your elbow up or down each time. I can't see the contact point but it sounds at times like you are playing too close to the bridge. That gives a metallic, non clear sound. For intonation and finger placement, try playing mini scales with open string then 1, 2, 3 and a determined key. For example D, E, F#, G = 0, 1, 2, 3 with the 3 real close to the second finger.